My flight down to Maimi for IMLS’s WebWise conference was pretty uneventful… that is accept for the small discovery I almost missed making because I never really pay attention to the in-flight magazines. 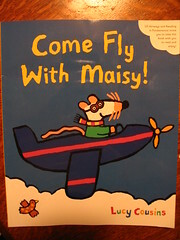 But the shiny blue cover depicting my youngest daughter’s former favorite board book friend caught my eye and I was pleased to see that USAirways and RIF have teamed up to promote reading. 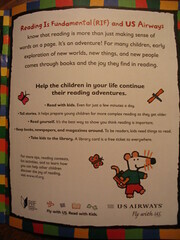 The book itself is great and offers a handful of helpful tips for parents on the back cover, including “Take kids to the library: A library card is a free ticket to everywhere “ But even with all the goodness, I couldn’t help but wonder… why is this the type of campaign that public libraries aren’t in on the ground floor (or perhaps I should say "runway") with? Instead of being the 5th (& last) bullet point on the back cover… we should be the primary partner/sponsor on the cover! Don’t ya think?